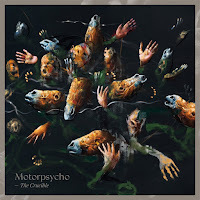 Looking at the cover art, it is clear that Motorpsycho sees a link between its previous album 'The Tower' and its new album The Crucible. The art has some resemblance as latter day Hieronymus Bosch paintings. 'The Tower' held several long, part experimental, part song structured compositions. The Crucible holds three long compositions in the same vein. Melodic, vocal passages alternate with long jams where a theme is explored on guitar, bass or keyboard while the drums pound away in the "background". My very first impression is Motorpsycho presents itself as a powerhouse on its latest song collection. Another word is simply, wow. The high level of musicianship the Trondheim based band displayed on its previous album is easily maintained here. The combination of song and exploration again is presented so strong that its easy to conclude that the dip I noticed say around 2010 is totally gone. Motorpsycho is releasing records for nearly 30 years. The band came into my life with 'Let Them Eat Cake', that I did not buy first time around. It was 'Phanerothyme' I bought a year later and came back to 'Let Them Eat Cake' any way. Since then I followed the band for most of the years up to circa 2010, to return with 'Heavy Monsters', albeit reluctantly. 'The Tower' really brought me back, including the fantastic show in Alkmaar last year. Full of enormous power and energy. That is exactly what The Crucible offers to Motorpsycho fans. The album offers it in abundance. Of course there are no surprises. The trio does what it is good at. Think up a basic melody and hunt it down in the studio until it holds no more surprises; at least until they reincarnate live. There totally new vantage points could be discovered any way. In a way the metal sounding opening of The Crucible is a surprise. 'Psychotzar' opens extremely loud. A huge guitar riff opens the album, a mellotron softens it just a little, but not a lot. Motorpsycho explores classic rock in its own style. There's no other word for it. 'Psychotzar' is no Deep Purple nor Led Zeppelin. This is what comes out though after this kind of music has gone through the Motorpsycho blender. Loud, fierce, solid, with always a melody around that only Motorpsycho can come up with. There're so many guitars flying about. Hans Magnus Ryan must have taken out his whole collection and stuck them in here one by one. The bass amp almost explodes under all the effects put on it by Bent Saether. After six minutes into the song there's even an interlude. Soft and ever getting louder, until the riffing starts all over again. Solid like a rock formation 'Psychotzar' is. In 'Lux Aeterna' something surprising happens. The twists in the song sound just like Soup played on its latest studio album, 'Remedies'. Something not too strange as both bands come from the same city in Norway. It provides 'Lux Aeterna' with a little air as this composition has some extreme sides. It starts off ever so softly though. The CSN side to Motorpsycho gets aired here. Just an acoustic guitar and a voice. Slowly the song gets bigger, smaller, while the Mellotron gets a high place, especially in the 'Soup' section. Then the extreme and fast side breaks loose. Drummer Tomas Järmyr can really go full out in this almost jazz rock like interlude. There's devils and hellhounds on the tail of the whole band here. After the narrow escape all crash to the floor panting and puffing in what is one of the highlights of The Crucible. Not just because of the contrast between the two instrumental sequences, no, because it is so powerful, so melodic and extremely strong. The switch back to the acoustic CSN side is almost impossible and can only happen by letting all the noise die out, "to take the pain away", as the band sings. The Soup like sequence ends it all in grand fashion. 'Lux Aeterna' is another highlight in Motorpsycho's career and should be a great addition live. From darkness to eternal light indeed. The third song is nearly 21 minutes long. 'The Crucible' shoots out of the grooves instantly. Follow it and again you will be surprised by all the twists and turns the band lays into the long composition. The only thing against it and this is extremely relative, is that it holds no surprises. This is a 100% Motorpsycho song, like they ought to be. Recently I have started listening to the early albums of Dutch symphonic rockers Earth & Fire and Focus. Several parts of the music on The Crucible remind me of what I've heard on albums like 'Focus II' and 'Songs Of The Marching Children' and 'Atlantis'. 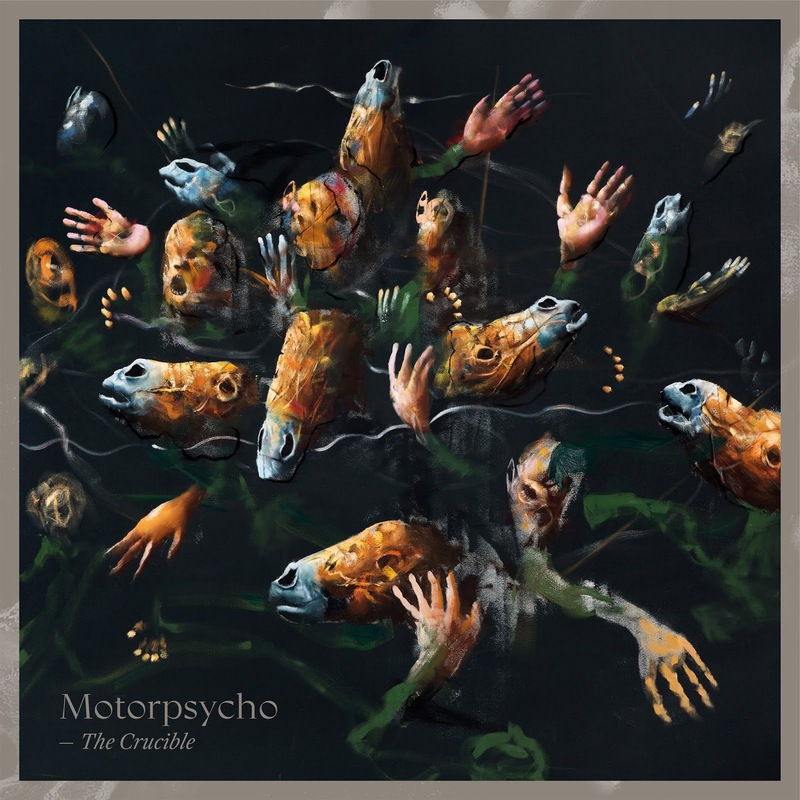 Motorpsycho is able and willing to be far more extreme in its choices, but also to tap on nearly 50 years of experience in sympho and prog. Knowledge it obviously uses to its great advantage and turn it into a unique beast of its own. Motorpsycho is not the inventor, but the magician's pupil that regularly outshines its master effortlessly. The Crucible is another highlight in Motorpsycho's vast oeuvre.